‘News is what somebody wants to suppress- all the rest is advertising’. While the main newspaper tells you stories of maids being assaulted in Delhi, the magazine supplement (Gurgaon Times) tells a different story. 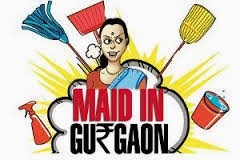 As you read the newspaper supplement where they tell you that Gurgaon residents are looking for maids with passports, a sinking feeling envelops you like the dust haze embracing NCR. The fact that I live in Gurgaon exacerbates it for me. At a time when inflation is battering us black and blue, publishing stories about the privileged is more like dangling celery and asparagus on every woman’s face who is struggling to dice onions and tomatoes for salad. But Gurgaon being Gurgaon, one learns to live with the feeling that you are nobody unless you wear a Herve Leger, carry a Fendi or flaunt a Tissot. No, don’t get me wrong. Gurgaon’s newly minted residents, bless them, are modern, but rooted in culture. My newspaper tells me that they celebrate all festivals from Holi to Halloween with fervor, albeit with a futuristic twist. While the women religiously fast for their husbands on Karwachauth, they prefer to break the fast by using an app which turns their smart phone into a channi. Likewise, there is always a reason for Gurgaon- wallas to party. And Halloween is an interesting one. Another paper tells me that social creepers were planning to buy expensive Evil Queen costumes and skull shaped diamond earrings to celebrate Halloween on foreign shores. I am assuming the maid with a passport accompanied them. Well, nothing wrong with that at all. I am pure jealous. Don’t judge me, I am human. Who wants to be a struggling writer, when you can be a household cook and enjoy a paid vacation on the beaches of Seychelles? Every morning after reading the newspaper supplement splashed with advertisements, the urge to get intoxicated and numb the feelings of emptiness and inadequacy overwhelm me. As it happens, there is a 24/7 online home delivery of wine and liquor in Gurgaon. That is if you can decide between a kilogram of onions and a bottle of booze. But frankly, there is little point in cribbing and whining. I have two options. For minimum impact, I am contemplating reading the national daily with a glass in my hand. As I read the magazine supplement and snuff wine, I can imagine myself dressed as a billboard, hopping on my chartered plane and celebrating festivals in style. So what if Diwali is over, Christmas is on the horizon. The other, better option is to read the main newspaper. It tells me that there is a slowdown in the festive spirit as price rise has hit sales. It also tells me that Gurgaon’s top cop suffers from dengue and that two people were stabbed to death in a call center. Bad is never good until worse happens. One kilogram of onions hitting a century is better than one onion hitting a century. To hell with the maid with a passport - there is joy in simple things. Like watching television with the family. Like taking a walk in the park. And news? Well, as they say, ‘No news is good news’. All the rest is advertising. 1. Switched to 'The Hindu' after loving TOI to bits-n-bikinis, even when I worked for HT. For reasons similar to yours. 2. There is either salad for dinner, or food. Never the 2 together. Although, similar salaried houses have opened a few educational institutes recently, and I too am pure jealous. I'm human too! 3. I bought a pack of 12 spoons on Dhanteras. Stainless steel, of course. 4. On Halloween, I simply left my hair uncombed. It's free! 5. I do eat in 'PrivileDged Punjabi' restaurant in West Delhi once a month. To feel privileged, of course. How else how else? :D I'm sharing this masterpiece! Ha ha. Thank you for sharing Sakshi. I didn't even know it was Halloween until a girl dressed as Dracula rang my bell and shouted 'Trick or Treat'. As for the spoons, ditto! So I am not the only one who feels inadequate after reading Gurgaon Times! This article should begin with a disclaimer - "Reading any further could be injurious to the psyche of simpleton sarkari naukars, their kith & kin & those of their ilk !" Thank you Senthil. Gurgaon does this to people- makes them feel inadequate.More so the magazine supplement. I used to love the glossy feel of these newspaper supplements. They were just perfect as lining for drawers. And isn't that what the city supplements are for - entertainment entertainment entertainment! When it comes to flaunting their lifestyles, Gurgaonwasis will spare no expenses. A delightful read, Alka. Loved it as always. I too love the glossy supplements , one for reading its 'rich' contents of expensive items and after reading and 'burying' my consumerism urges to lay 'rest' the glossy papers in the drawers. They look nice and my drawers look 'glossed' up. Entertainment, consumerism, in your face advertising or lifestyle of the socialites- they all make me feel as if I live on a different planet. Thanks Kalpana, Purba. Thank you for sharing Julia. Means a lot. Wow, Gurgaon and its newspapers seem to exist in a parallel reality, maids with passports, Halloween costumes, what will they think of reporting next!!! An awesome read, and an eye opener for a simple 'upwardly mobile' (read someone whose mobile bills are on an upward trend) monthly income earner like me. You said it. Parallel Reality is the word. Come back, its fun here. Lots of topics to write about. Welcome here Rex. Glad you liked. Wonderful post, Alka, keeping up with the Guptas just doesn't work for people like us, who have more common sense than brand labels. A funny anecdote: When our fridge broke down in more down-to-earth Noida, my 21-year-old maid, who had asked for cold water and been refused for above cited reasons, asked me, 'Aapke paas ek hi fridge hai kya?' Piqued, I asked, 'Ek se zyada ki kya zaroorat hai?' She returned with, 'Hamare ghar mein to do hai. Ek se thode hi kaam chalta hai.' PS: I got a metallic mug tree for Dhan Teras, Sakshi, mainly because I was tired of knocking down my mugs because I have so little counter space, but then, this is London. Welcome here Mimmy. Let me share mine. When we came here in 2010 from Bangalore, I called an electrician to change a bulb. Simply because I was unable to reach the socket. The guy asked me for five hundred bucks to change a bulb. When I protested he said, " Madam Gurgaon mein to pair(legs) rakhne ke paise lagte hain." Oh Gosh! It is all about show-sha baazi these days! Seriously, I also wonder the same stuff. Perhaps, we are too downmarket for them. Sometimes, the glossies far outweigh the newspapers. I hardly even glance at them as they are only filled with ads. Lovely read! Around Diwali, Dhanteras and Bhai Dooj, the glossies it seems are on steroids. Like Purba, I use the glossy supplements to line my cupboards. Don't find them of much use other wise ! The glossy supplements everywhere are the same. They are designed to dip everybody into a pool of 'nobodyness' as we look at people who apparently have more. Lovely read. These glossy supplements should be taken with a pinch of gloss oops I mean salt. Most people are battling inflation, cutting down on expenses, balancing family budgets and not worrying about what to wear for the Halloween party. To be taken with dollops of gloss. Moral? Read the main paper and use the supplement for lining the drawers. Enjoyed reading it..you wrote after a gap this time. Happy Holidays!! Yes I was busy with Diwali Prudhvi, hence the lag. Thank you. Welcome here Tashi. Glad you liked it. Ha ha, I wouldn't know much about Pune though my son is there. Maids with passports? Reminds me of a maid who worked in my mil's place in Chennai. The moment she knew I was in SIngapore and had to manage a small infant she kept saying that she is ready to come. I asked her 'Do you have a passport?' (Well, definitely required in this case). She retorted 'Passport! Whats that? Where can I get it? Is it like our ration card? or our bank passbook' :D Many in India do not even know what a passport is!! Your article reminded me of the TOI supplement in Chennai. There would be a page full of photos from parties and bashes in some five star hotel of the city. And names no common man can relate to!! Glossy glossy and glossy!! Bang on Jaish. It is for the privileged. Anyway who wants to read about daily struggles? Nice account of the present times Alka! It reminds of reading about French Revolution in school when Mary Antionette said ' if you cannot afford bread why not eat cake"? So binge on Pizzas while onion and tomatoes prices hit the roof! I happened to celebrate Diwali with my cousin brother and his two adorable little kids. Bhabhi told me about some "kingdom" kind of mall or something. Apparently, it is an amazing place.it is also a place you want to talk about for one single reason- others should know how regular you are there :) Intrigues me. Everytime I am there, I fail to grasp even a bit of how people put up in these places (Bangalore, Gurgaon and the likes ). Everyone is trying to buy apartments and cars... and they talk of EMIs and Galaxy Notes or whatever. I wish people could talk about things more intrinsic to us all- like travelling to Brazilian rain forests, or some adventure. I know I wouldn't want my kids ( if at all ), to live in such environs which limit out imagination. Maybe that has something to do with my modest/small town upbringing. OR maybe there is something terribly wrong going on there. PS- I could be standing at one extreme and that is not the right place to be. But of course, there is something about consumerism that stirs me. The suicide rate. crime, and unhappiness quotient is also highest in metro's. It is a daily struggle to keep up the facade. MNC's may be paying fat salaries but job pressure is immense. Two people at a call center died because they were fighting for leave to go home for Diwali. The hype is due to some people who have moved from Delhi and US to live in exotic condominiums. Come on the road and there is no power, no sewage and no water supply. It is damn expensive to live here. Thanks Vinaya. I had a good one. Sad are our times, as you have written. But I do have one question - during your research for this post, did you manage to get the contact details of Ved and Brigette, the ones lounging in a 5-star pool the other day? What about Sonal and Ayushman at the party at that farmhouse? Peter and Sandra? How about Rukmini and whats-his-name? No? I guess it is difficult because no one on Page-3 appears to have a surname. They are just people everyone is simply supposed to know! I am glad for Gurgaon. Such an equalizer our city is. Whether you can only afford to buy a cheapo Mercedes E-Class or the fanciest Porsche Cayenne, everyone must deal with the same cattle herds and potholes. You are so right about the equalizer part. We all breathe in the same smog. Why Gurgaon?Every city has two parts.The problem arises if we refuse to accept that there are two classes-the privileged and the under/unprivileged.The supplement is for the former.But why then newspapers attach a supplement for the well heeled people along with the paper for levity.The fault lies with them. I enjoyed the hilarious but bitter piece!! It was a tongue-in-cheek take on the supplements.Thank you. There are times when I run out of toilet rolls and that is when the glossy supplements come in handy. And that is what I call putting them to good use. They are meant for that. Have you seen a 58 year old man giggle? Its a horrible sight. I giggled reading this cheeky piece. Its been ages since I read a newspaper, Alka, though everyday, our mailbox bulges with those free papers, the Hudson Gazette, the West Island Gazette. They go direct from the mailbox to the recycle bin. I'm designing an automated chute so they'll make the journey by themselves in future. With all that is going around there is little to smile. Keep smiling, keep giggling. Irrespective of the age. Shove your worries along with the supplement via that automated chute. Thank God I don't read them anymore. One glance to check if I might have wronged something important, my doubts are reconfirmed by the grime spread across. But, it is necessary. Everyone cannot be an ostrich like me, with the head deep in the sand. They sure have entertainment value. If you don't feel disadvantaged or inadequate after reading the Page 3 escapades. I still read the main paper because I just cannot get the charm of reading one out of my system. As far as the supplement goes, it usually ends up as the platform on which i clean my leafy veggies :P On reading your post I feel I have been doing the right thing all along! Welcome here Seeta. Glad you stopped by. I use them to clean my greens too. Gurgaon is ie place in NCR where the disposable income is in abundance. As for news papers..buying them is now a stsus symbol though anyone hardle reads them. 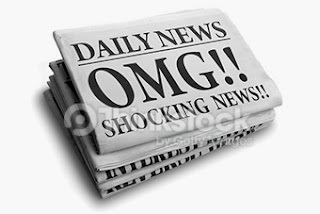 Late night TV news is enough..News papers are a source of dipression. Glad you agree Chowla Ji. Alka ji . hats off to you . What a fantabulous write up . MIxing facts & fun perfectly . Brilliant . Maids with passports? Wonder how deep the divide in the society is going to get! Enjoyed the humor you laced the post with. Glad you enjoyed Indrani. 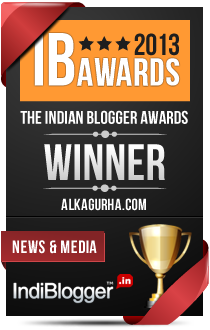 Thanks for voting on the Indivine. Ha ha, so the feeling s universal. Thanks Uma. Inflation is at an all time high. It is now hurting the upper middle class too. Freebird Alka You have excellent writing skills.If Maids with a Passport .....is true it is really interesting and new(s) to me.The humour and the fast pace was awsome.You are right nothing is bad till it is successful. Welcome here. Thank you for stopping by. Maids with passports!! Looks like Gurgaon is on altogether a different planet!! Only a select few who need maids to care of the kids while they shop abroad. This is not only in Gurgaon but all over. I find the glossy paper useful for other purposes in the house. I used to get two newspapers in the house, now cut it down to one. No point in going through the ads all over again in the second paper. Maids with passport? This is news to me. True. Supplements gain muscle around Diwali. The supplement during Diwali almost became a weekly magazine. I don't remember going past even the first page.